Talented Saxophonist Friedel Knobel plays classy and sophisticated live Saxophone background music for dinner parties, weddings, private functions & corporate events entertainment, providing an elegant and relaxing yet unobtrusive atmosphere. Playing is described as smooth, sensitive and passionate, and of adding a sense of style & elegance to any occasion. The repertoire encompasses a wide variety of easy-listening ageless music, accessible to all, and includes various Jazz & Latin standards, Gospel (weddings), popular Contemporary Pop and Oldie ballads, as well as many recognized saxophone tunes, and is well suited to sundowner or dining sets. Typical functions performed at include bridal ceremony, pre-reception and/or reception, garden & birthday parties, cocktail lounges, art galleries, year-end & other special / gala functions, award & prize-giving ceremonies, product launches, exhibitions, etc. For rates & bookings in South Africa, Gauteng ( Pretoria, Johannesburg, Midrand ) and surrounding areas of Limpopo, Mpumalanga, North West province, KwaZulu-Natal, the Free State (+- 400km). 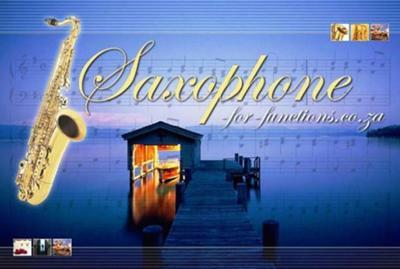 Audio / video samples & testimonials at saxophone-for-functions website. Contact number 082 807 4333 all hours. Excellent performance & music selection, professional & reliable service!